Process payroll, send paychecks (printed and/or by Direct Deposit) and stubs, and file all payroll tax returns. Print real returns and paychecks in minutes with an intuitive and easy-to-use interface that is common to other CFS programs. Process live payroll or enter paychecks after-the-fact with CFS 941/940 (included). Enter payroll data on a daily, quarterly, monthly or paycheck basis. Automatically calculate wages based on the employee’s annual salary or hours worked and hourly rate, federal withholding, state withholding, local withholding, Social Security, Medicare, and other payroll deductions. Customize income, tax, and deduction items for each employer. Print paychecks on blank check stock, preprinted checks, or as pay stubs. Produce payroll for an unlimited number of employers with an unlimited number of employees. Import QuickBooks® after-the-fact paycheck data to save data entry time. Use all the clients, forms and features of CFS 941/940, included with your purchase at no extra charge. Transmit payment for your clients' employees or for your own. Low one-time setup cost: $19.95 per customer, then $14.95 for each employer. Powered by National Payment Corporation (NatPay), which processes more than $12 billion in employee direct deposits annually. 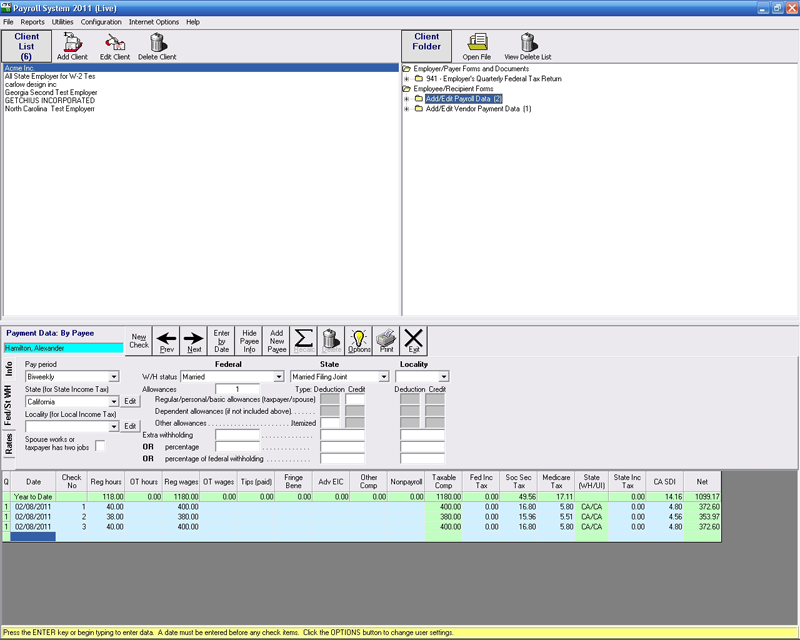 Transaction history reports in both Payroll System or NatPay web portal. Instructional videos and help files. Four funding options covering between 1-4 business days of turnaround time. There is a one-time setup fee of $19.95 per CFS customer and $14.95 per employer. LivePayroll ™ is released before the start of each year.